Last weekend the first tournament of the year took place in Antwerp. It’s called First blood and this year it was a masters format event. 23 players showed up and considering about 8 regular attendees had other engagements this year, that’s an amazing number (for Belgium). Once again a special thanks to the Puppeteers and Pressganger Nicolaï (Rynar) for hosting the event and making it a great experience each year. I took my convergence to the event and ended up going 2/2, which is a good result considering I just started playing my lists around New Year. 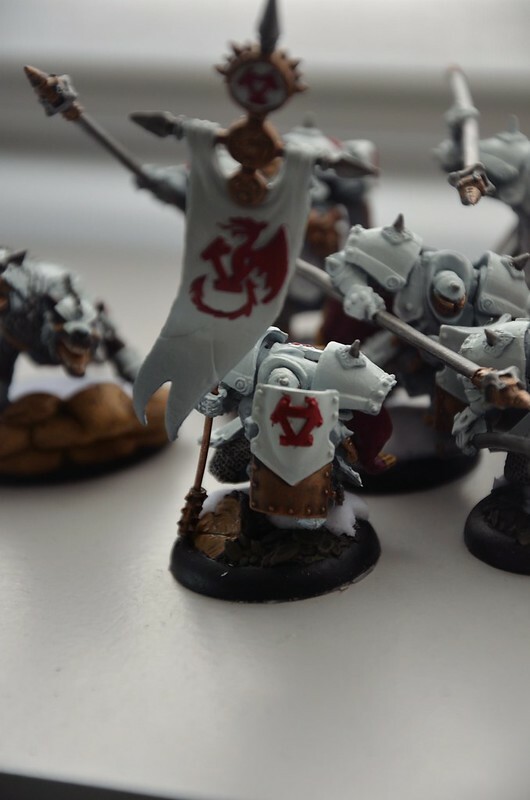 The army can only include the models listed above. Enigma Foundries are FA 4. 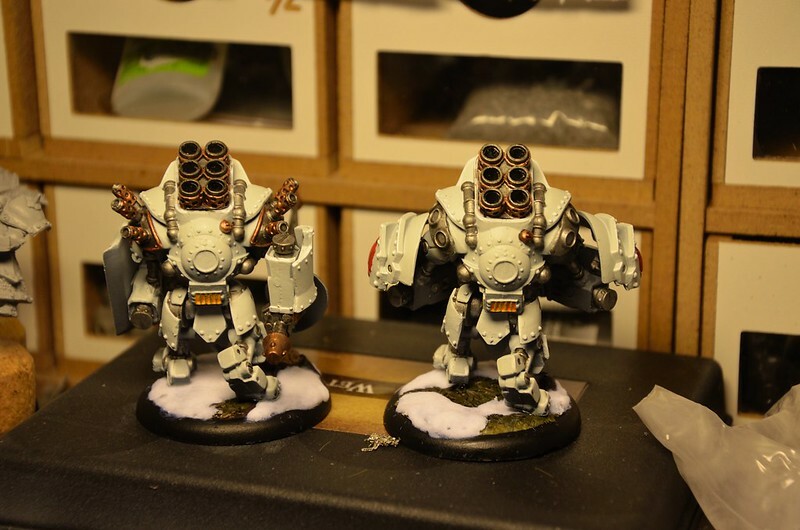 The army includes two or more Enigma Foundries. Reduce the point cost of Enigma Foundries by 1. 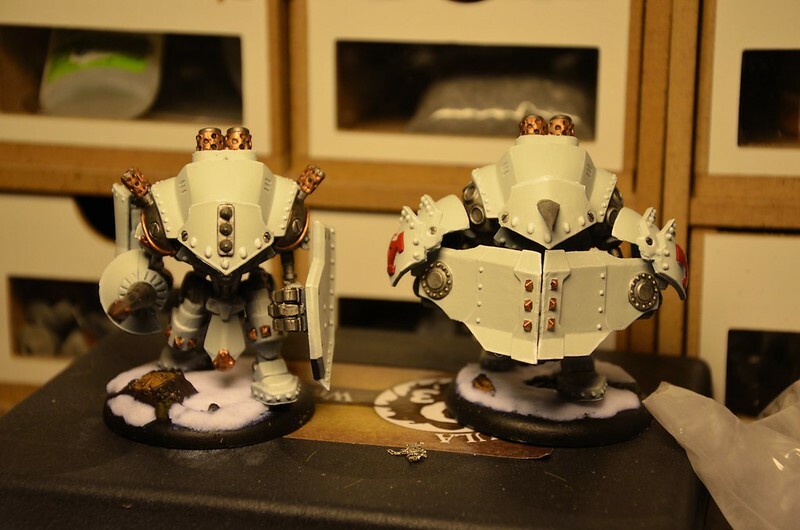 The army includes three or more Clockwork Vessel units. 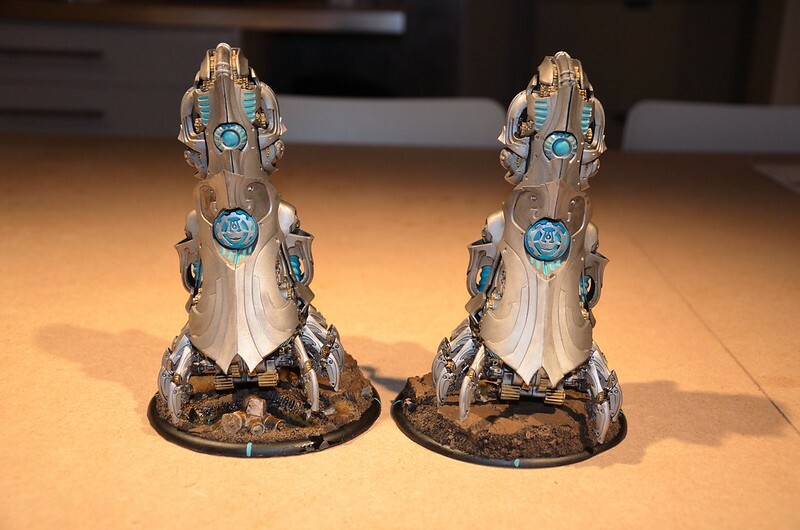 Clockwork Vessel units gain Advance Deployment. The army includes two or more heavy vectors. 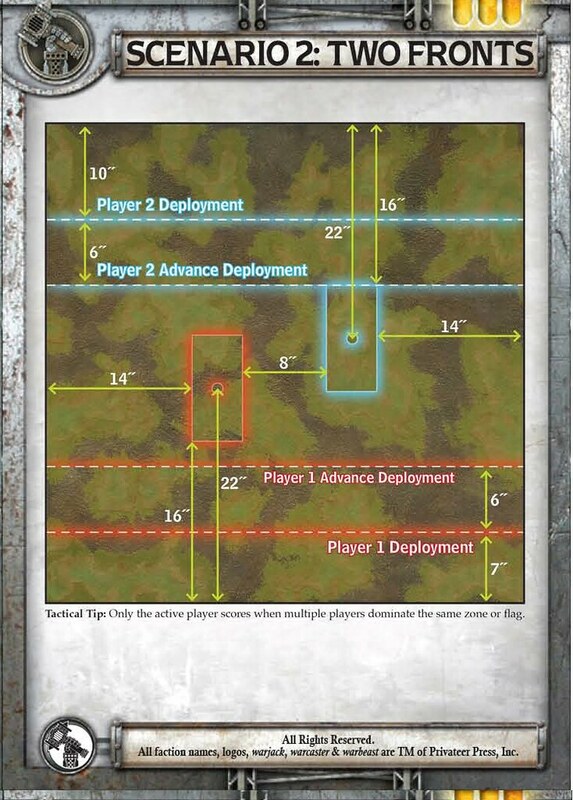 For each heavy vector in Axis’ battlegroup, place a heavy warjack wreck marker anywhere within 20″ of the back edge of Axis’ deployment zone after terrain has been placed but before either player deploys his army. 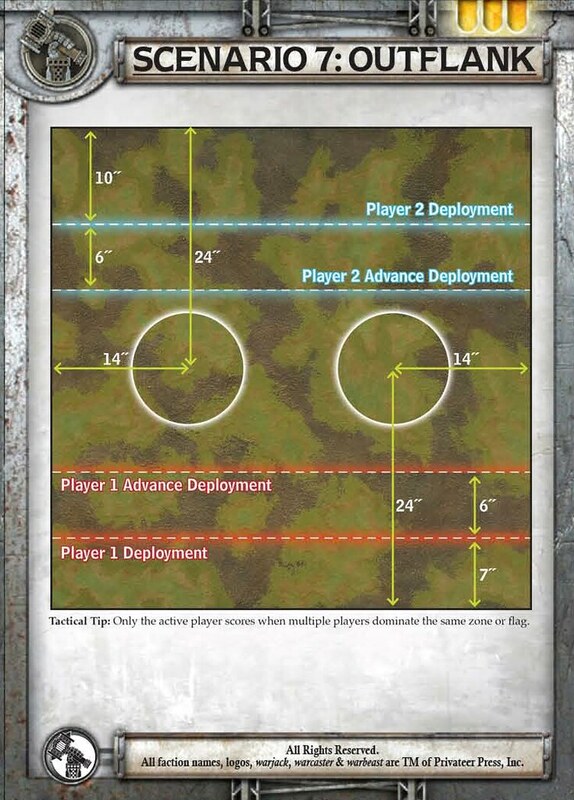 Wreck markers cannot be placed within 3″ of a terrain feature or another wreck marker. My opponent was Davy, a Cryx player from Hasselt. His caster pairing was Denny3 / Scaverous. I looked at his lists and saw some armor cracking potential and I was unsure if my Lucant list would deal with it well enough. He also didn’t have much shooting at all (aside from a Kraken in one list) which meant deceleration wouldn’t do much. I haven’t put my Lucant across from armor cracking enough yet to judge if the list can or cannot take certain match combos and that makes me reach for Axis more then I should. With Axis I feel I can force things by throwing models into the opposition over and over. It’s the idea where lots of small punches form one big punch over time I guess. And a massive wall of models is a massive wall of models, the other army needs a large volume of attacks so it can A remove lots of models and B remove more than I can return turn after turn. I chose my axis list and he opted to use his Denny3 list. I don’t remember who won the roll off, but I do think Davy got to choose sides, just not if it was because he opted to or because I chose to have the first turn. 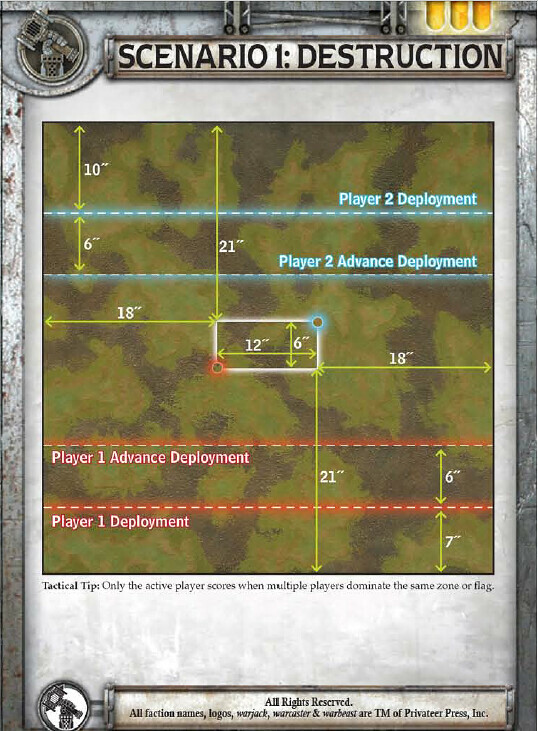 I was able to somewhat steer the flow of the Cryx troops by putting axis’s razor wall next to the objective at the edge of the zone, leaving a gap between the objective and the wall that was smaller than a small base. 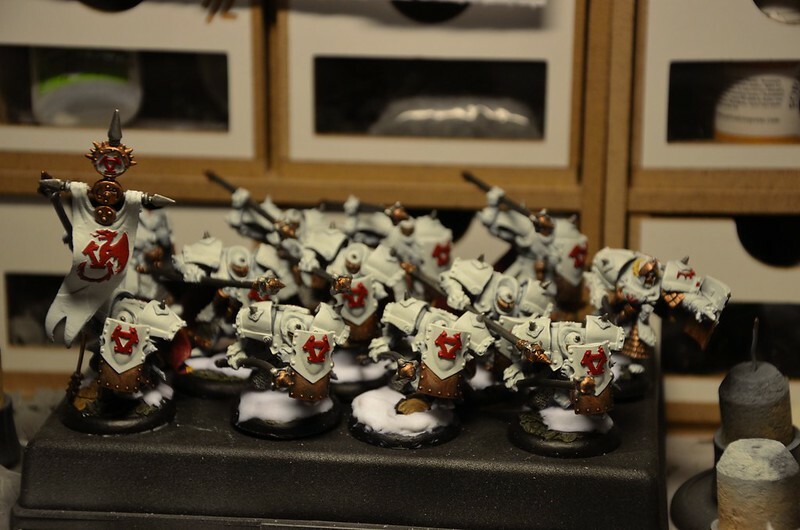 Having more troops than the Cryx list and limiting the access to the zone meant the Cryx troops would not be free to move all around as they pleased. The Kraken also flanked the troops limiting their advance in the other direction as well. I got lucky early on when one Reductor was able to spray the arcnode and took out one of the Soul trappers in the process. 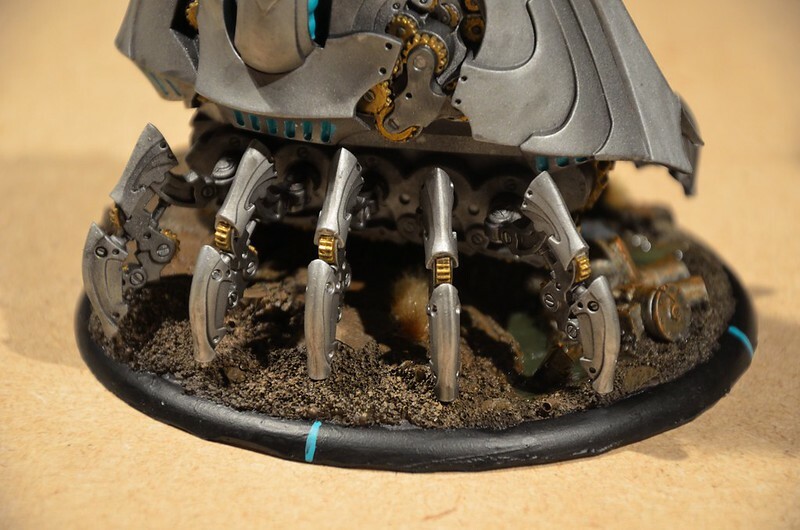 This removed any hope of collecting should on that flank for Cryx. Most bane knights died to POW 13 sprays from the reductors taking few victims in return. 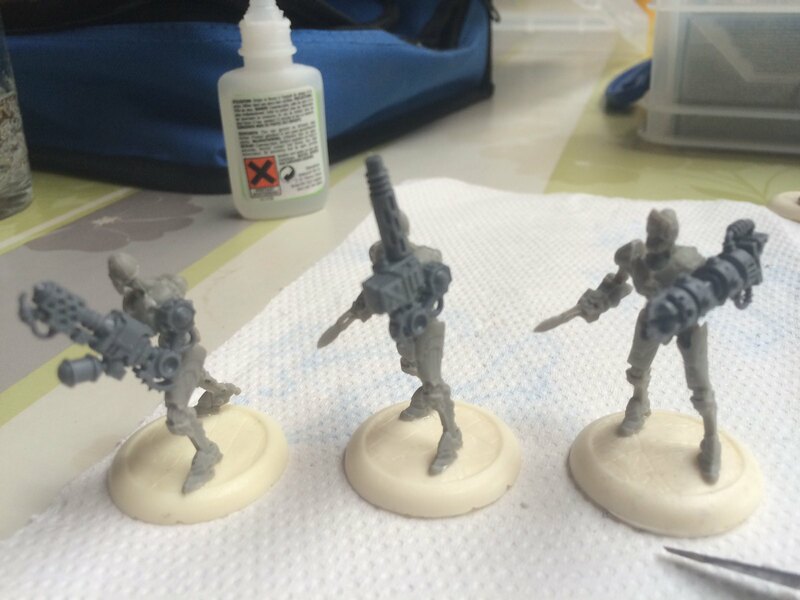 The bane thralls came in small numbers bit by bit and were easy to deal with that way. Tartarus made a charge and was counter charged by the Conservator and with Onslaught + hand of Vengeance he was killed on the spot, not even able to make his charge attack. The main problem for me was the Kraken touching the zone and making scoring impossible. It took me 3 turns and the feat but I took it down. I the end I had the zone swarmed with troops and all he had left was Denny and a Scarlock. Denny removed quite a bit of my troops herself, however casters don’t contest…so it didn’t mean much for the scenario. Attrition is was the main tactic (and the general theme for convergence at this point really). And when you say attrition you say time consumption. At the end clocks were running low and mistakes were made. 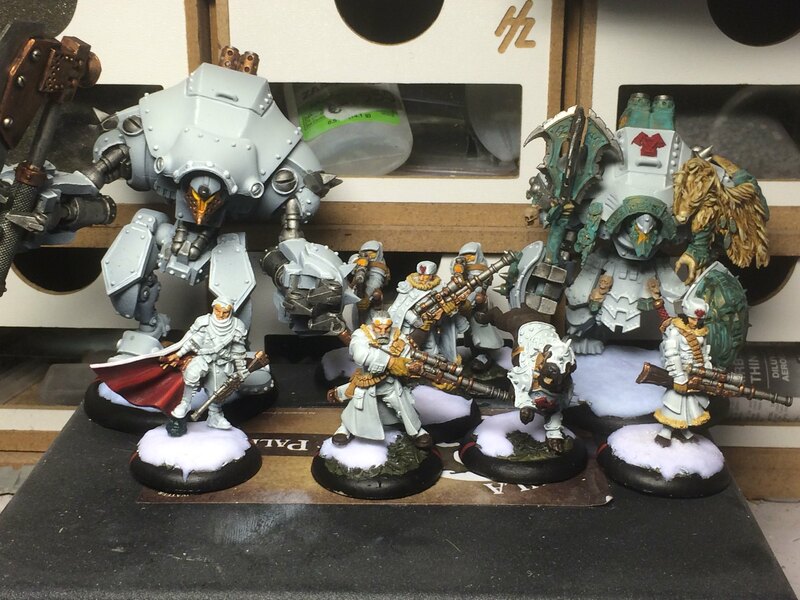 I was too obsessed with setting things up so that Denny would be tempted to go on a killing spree while making the assassination look less likely (full camp and a circle of 6 ADO models surrounding the caster). With only 3 min left on the other end of the clock tempting the other side to spend lots of time on attacks was a decent play. In hindsight I could have ran my caster into the zone and scored the final 2 points. Instead I scored only 1. Denny made her attempt to assassinate Axis and I was lucky no dice spikes happened and got away with 0 damage. Won the game with 5-0 on scenario. All-in-all a good game, first time facing Cryx after switching to Convergence again, so not a bad result. The 2nd game I was matched with another Cryx player. A Dutch player called Sietse. I can’t remember what his second list was in the pairing but he opted to drop his pSkarre list. I deployed pretty wide so I could get my units all over the board ASAP. On turn 2 I managed to shoot one of the Soulhunters with a Reductor (High rolls do happen). I moved up conservatively trying not to give away the entire army. Seeing both Gerlak and Tartarus on the other side gave me a headache since those combined alone would tilt attrition in his favor and that’s without considering the feat and other attacks. I felt like it was going to be a long hard battle and I would have to keep focused in order to stay in the game. Then on his 2nd turn he feats and sends Gerlak in. He pacmans his way around and ends up smack in the middle of my troops. I decide to counter charge with the Conservator who has Iron Aggression and Hand of Vengeance. I manage to do only 3 damage, could have been a bit better tbh, on an average role that should have been 5 damage (pow 17 + 10 = 27 vs armor 22) and a slight spike of rolling 13 would have meant Gerlak was no more. I did roll some amazing dice on the soul hunter before so I guess it all evens out in the end ^^. Gerlak continues his pac man chain and I decide to counter charge him with my caster. This time I do manage to kill him outright, however it also lost me the game. Axis got charged by 4 Sat Raiders under feat (desperate pace and good speed get you places). I took 2 attacks of which the last one only needed to do 1 point. I shouldn’t have been so greedy, and it would have saved my casters life. That being said, I don’t know how much of my army would have survived that turn. Gerlak pretty much removed as much as I can return on his own. I do have some ideas on how to play it next time. I just made a rookie mistake in my first game with Axis against a pretty amazing caster played by a pretty decent player, so I’m not feeling too bad about the outcome there. In my third game I went up against Eric, a Khador player from Gent. His pairing was Old Witch / Karchev. Both Karchev and Old witch had a ton of armor in their list, and while old witch could be handled by Lucan just fine, Karchev seemed like he would be able to take that list down a little too smoothly. Axis may not have the armor cracking required to take on any of these lists but then he does have enough bodies to keep it busy for a long time while he nibbles at the armor. I was able to place my razor wall in a good spot so it blocked the movement of the kayazy early on, which bought me some freedom. He put the kayazy in one zone, the conquest and Spriggan in the other. Behemoth stood in between the zones. The old with was in a trench at the end of his friendly zone with the kayazy and the war dog close. I swarmed my friendly zone with a unit of obstructors and a unit of reductors; a unit of obstructors remained more central and the remaining unit of Reductors and obstructors went into the enemy zone. I had 2 big issues, the kayazy could get to defense levels no combine could hit without a dice spike with Iron Flesh and the combination of Conquest / Spriggan / Behemoth was challenging my power output on the damage end. I ended up clocking myself, I removed the spriggan, the conquest was half gone and the Behemoth didn’t look to alive either (still alive though). 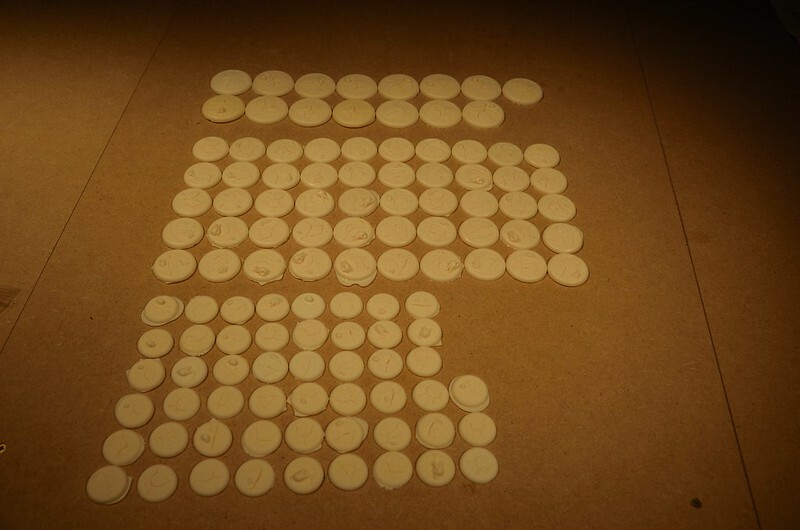 During one of the old witch’s killing sprees she did get counter charged and took a big hit from my Conservator. I did something then which may put me on the podium for sportsmanship but it also lost me the game. I reminded the other player that the Old witch isn’t immune to free strikes when she does her little move after killing a model. The free strike (with Onslaught and Hand of Vengeance) would have almost certainly ended her and won me the game. Still it was a fun and certainly challenging game for both sides. My 4th round I faced Tim, a Menoth player from Antwerp and he was Iron listing Anston Durst. I had played Axis 3 rounds, and so I really wanted to drop Lucant at least one time, just to be able to get some more experience with him. The benefit of facing a player who iron lists is that you can choose whatever list you want and you already know what you will be facing up front. I saw nothing that really threatened my Lucant list except the jacks if they combined their efforts, but on a split scenario I could make that work. In my second turn I was facing Anstons feat. The feat could have been an issue however, the 2nd jack was on the flank and a few inches out of Anston’s control and Anston for some reason hadn’t used cornerstone, so drags were a possibility. I had the Axiom Aim and shoot the Reckoner in front of Anston and I sadly left it on 1 box. Considering this was the only jack in control for the next turn, and it had lost its cortex, it was still good since all real treats to my models were not in a position where they could make a dent. Both TEP’s just sprayed what they could all game long removing a nice amount of the infantry. 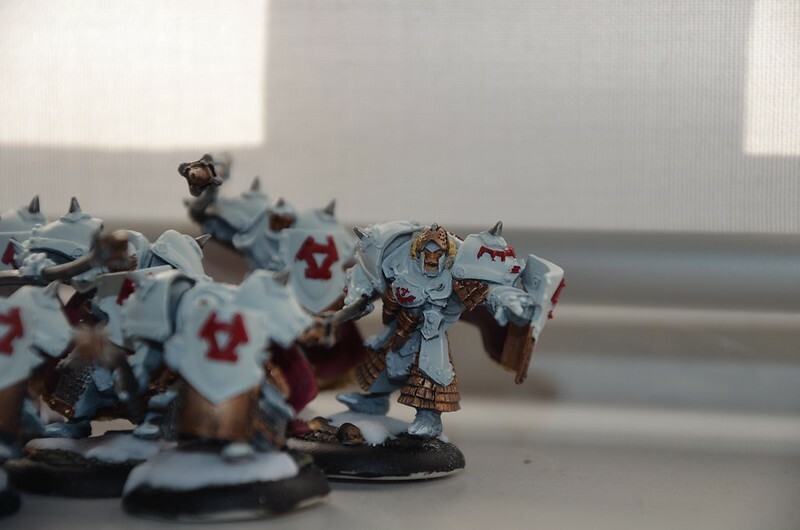 The Menoth player ended the game because he realized he couldn’t muster the force required to go up against and axiom and 2 Teps and behind the 3 huge bases there was no chance of getting to Lucant either. 2 win / 2 loss is a result I’m happy with at this point in time. Especially considering it could have been 3/1 looking at my 3rd round. I’m not going to make changes to my lists as I didn’t spot any real flaws or shortcomings I could solve by swapping models. Convergences doesn’t have multiple options for each role at this point and the units that are there do a solid job. All I really need to do now is get more practice. Mainly to see what matchups each of my lists can or can’t handle, there is some middle ground between the 2 lists and it’s not so clear which one comes out on top in that area. I’m having fun and I’m improving with the faction I like the most fluff / looks wise so all is good. 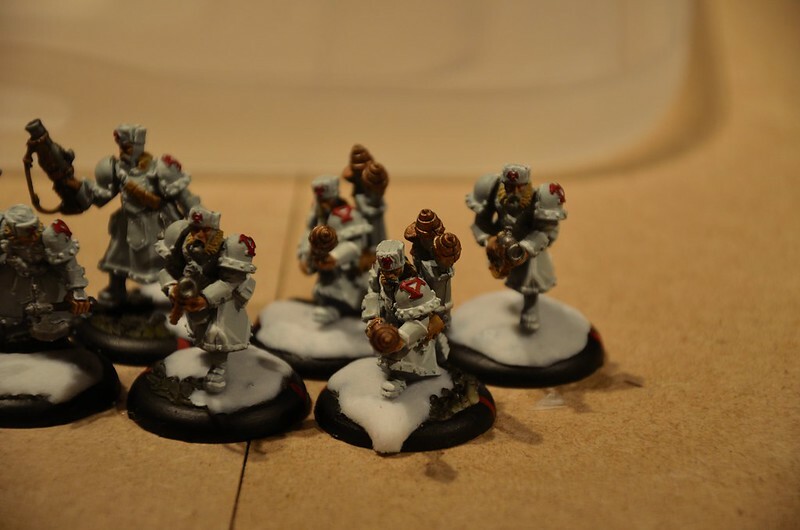 My painting is progressing at a steady pace, I finished Butcher 3 and the Pikemen. 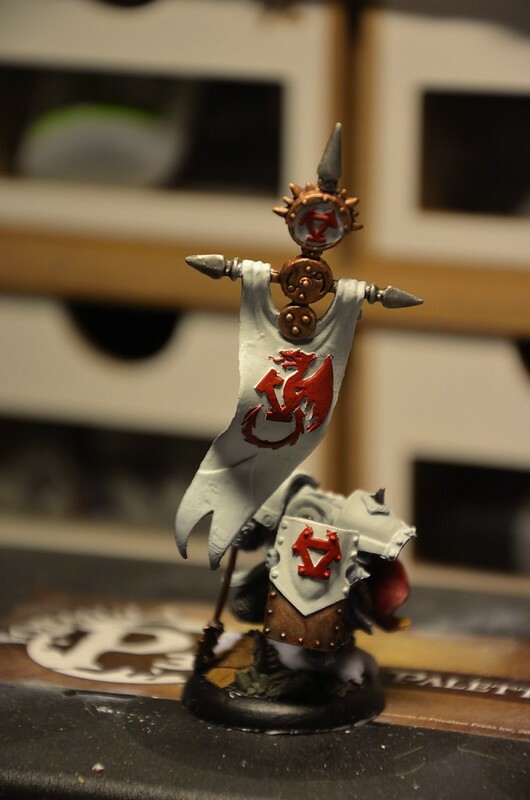 I made the flag swappable, the flag is the only difference between a black dragon and a regular unit. (Sure there are different shields but those arn’t required.) 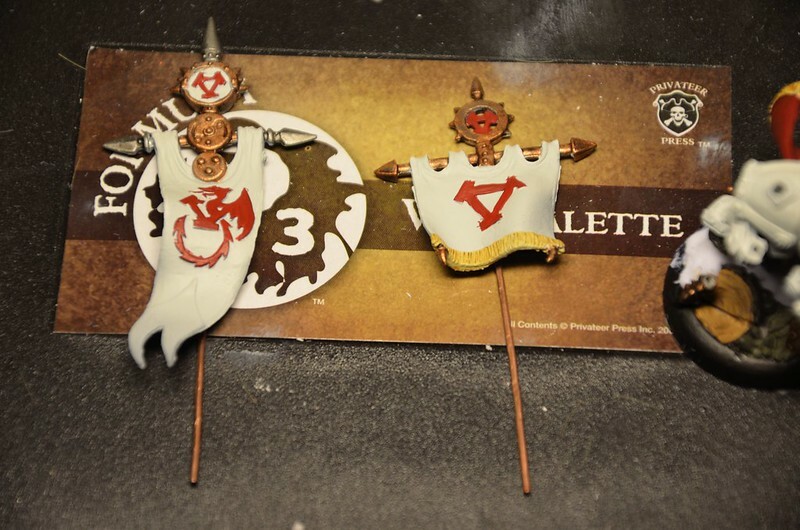 This way the only thing I need to do to change between ua’s is swap the flag, and transporting it is way easier. 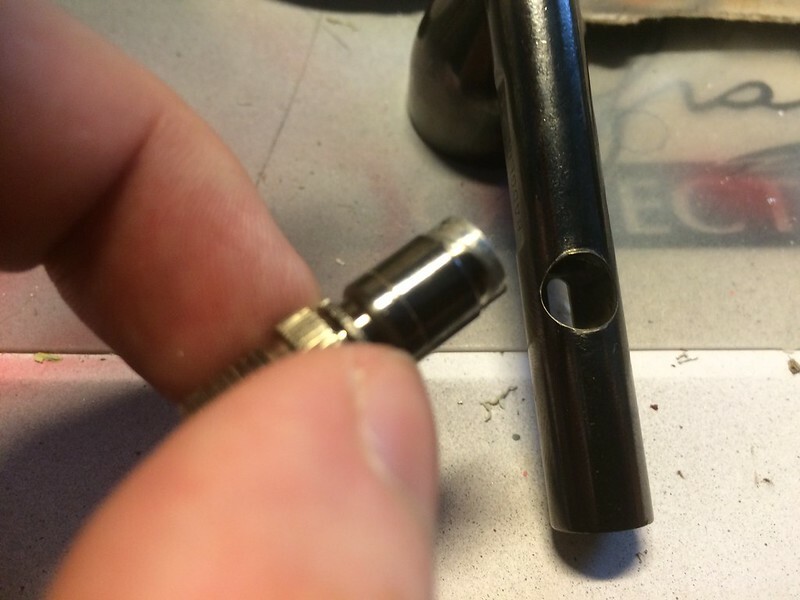 For those who don’t know much about airbrushes, no that part isn’t supposed to come off. Pretty sad about it right now, it has a warranty so it’s not going to be a financial issue as I won’t have to buy a new one, however I will be behind on my painting. Anyhow more news on painting / playing soon. 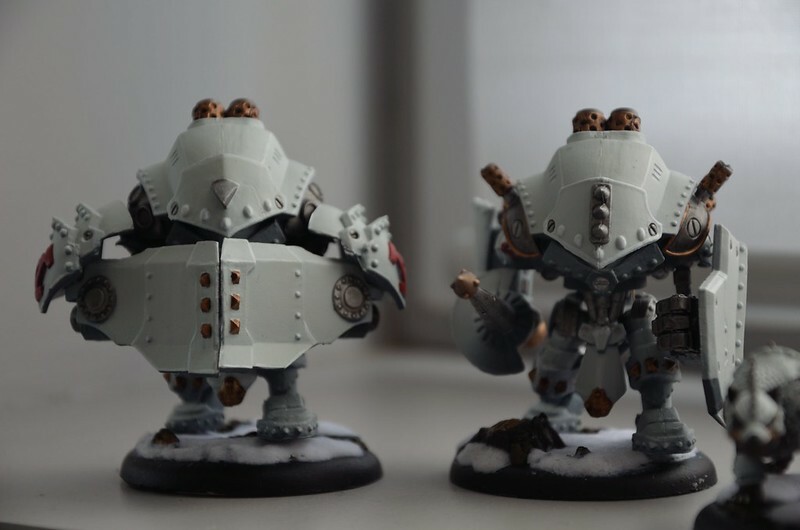 My first 2 models are d-o-n-e. 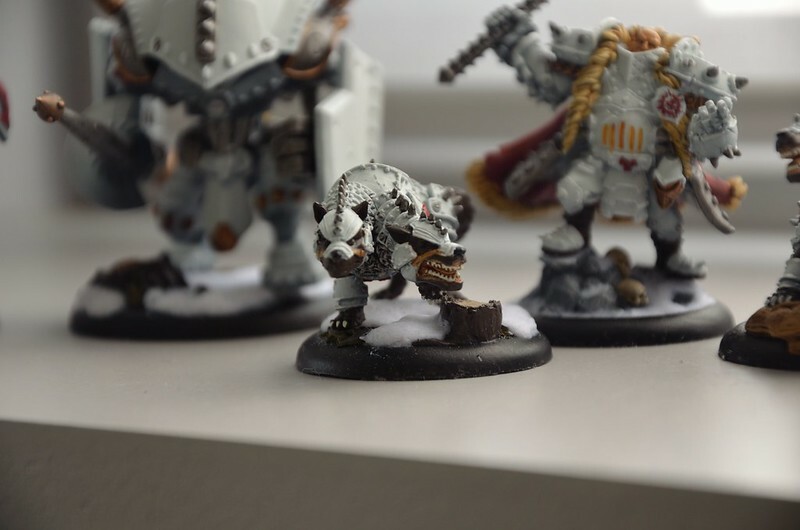 The photos don’t do them justice due to the white turning somewhat yellow under the lamp, but I’ll get some daylight pics up when I finish the next batch of models. 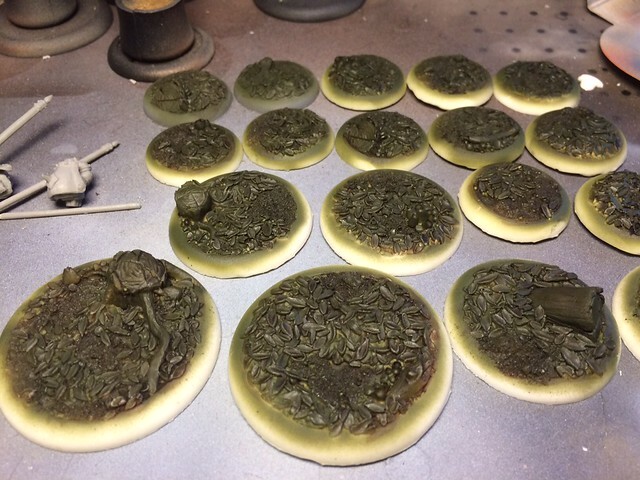 A while back, when I ordered my desert bases for my Skorne, I also ordered forest bases. 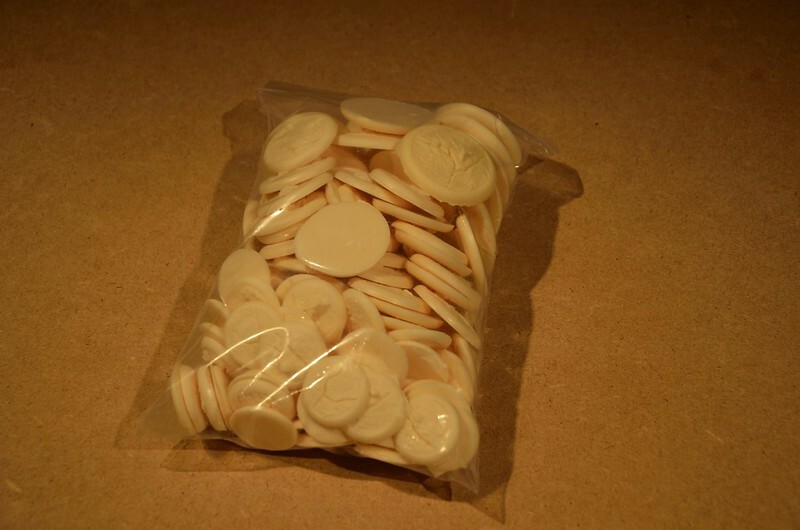 It saved me on transport costs and I had possible use for them with Ret or Circle, so why not. 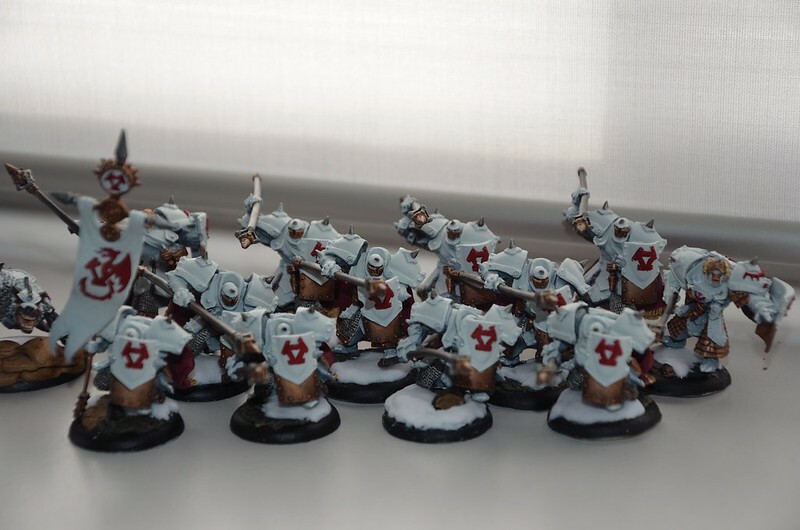 When I decided to start a Khador force, I contemplated my options for bases and I just couldn’t find ice or winter bases I liked. 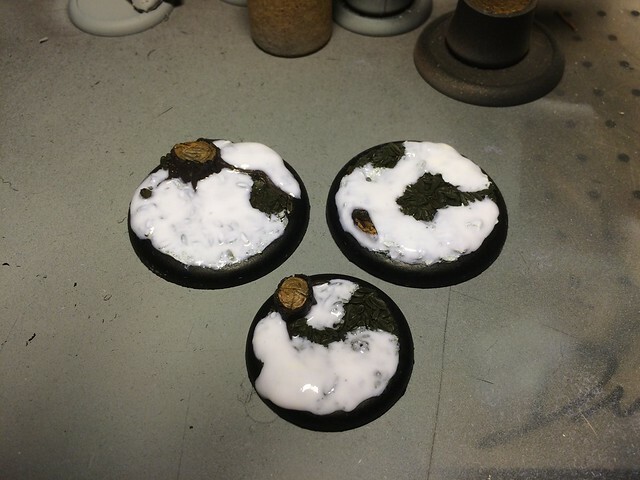 Then I realized I could just add snow to the forest bases and it all made sense. I applied a coating of GW castellan green with the airbrush on the entire base, then I painted the tree stumps and branches using GW Dryad Bark and P3 Rucksack Tan for the interior. 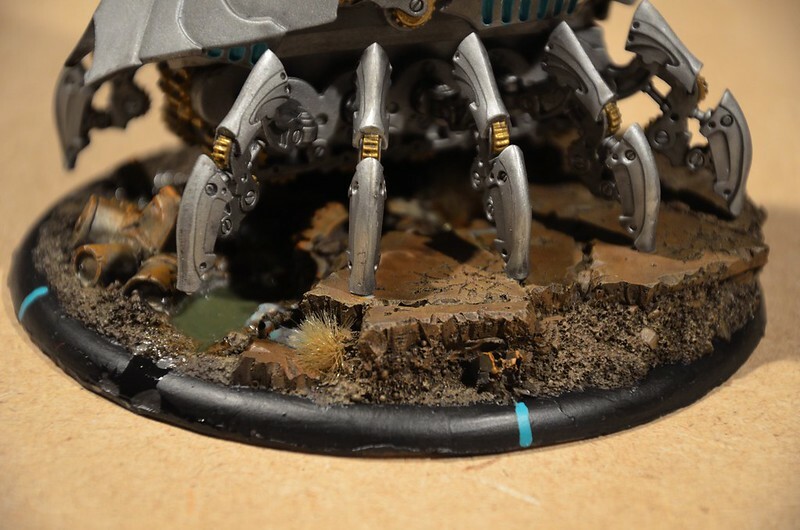 The entire surface was then washed with GW Agrax Earthshade. I then coated the areas who would end up covered in snow with Vallejo Dead White. 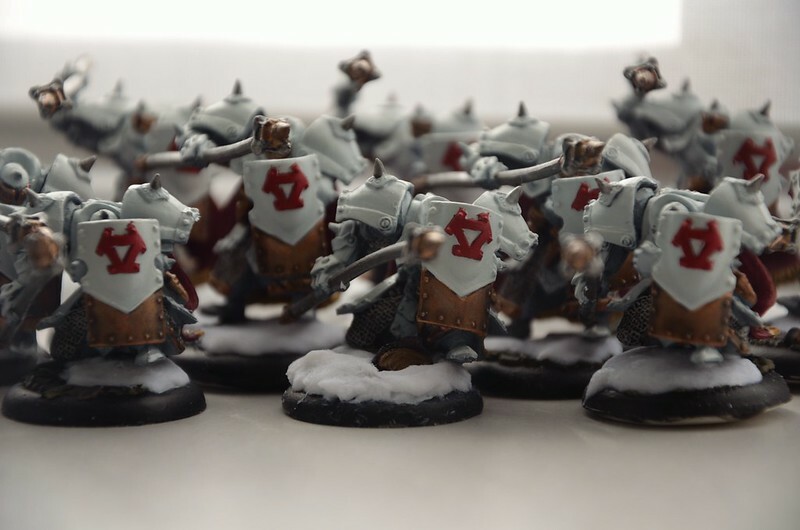 I had a few boxes of the GW snow flock sitting around. I first tried applying it like normal flock (watered down pva glue and add flock on top) but that didn’t turn out right at all. 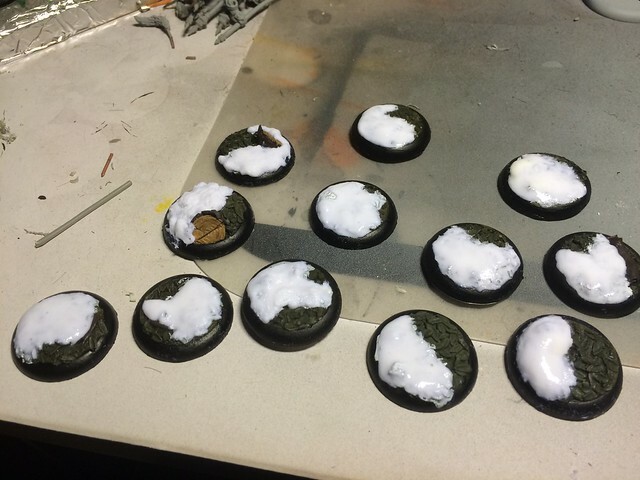 I then found a vid on youtube showing how to mix pva glue, water and the flock on a palette before applying it to the base. This way you can add a thicker paste to the base, which is far better to work with and instantly shows better results. I looked at the dried result this morning and I did add another layers of snow using the same method. 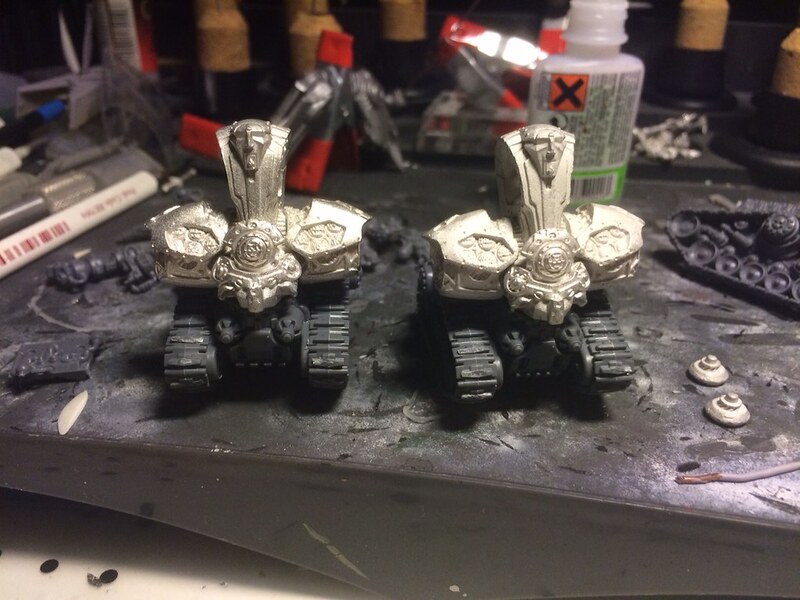 I hope I can add the jacks to their bases tonight. 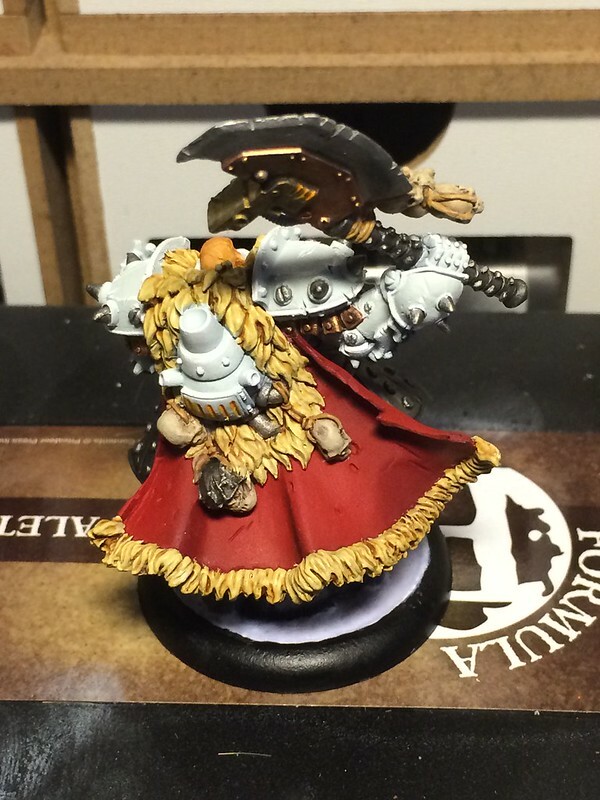 Khador has some really nice looks, but bright red is pretty much what everyone uses and that makes it less desirable. Bright red is the stock scheme so no surprise there really. In the end I got a golden tip from a friend who suggested white grey. 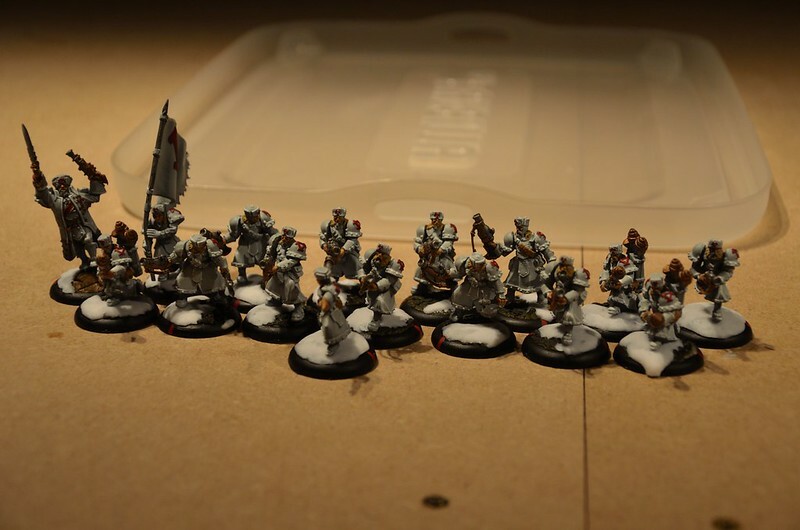 I primed in black, then did a basecoat of P3 Greatcoat Grey. 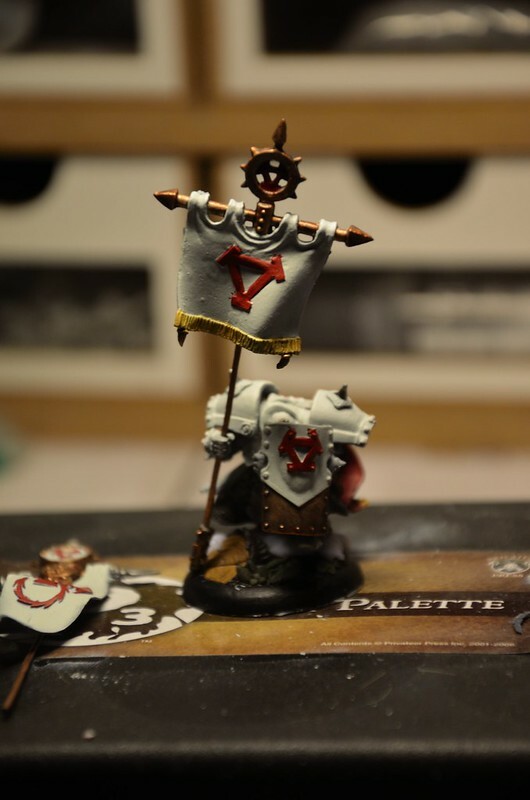 After that I used GW Administratum grey mixed with P3 Greatcoat Grey. 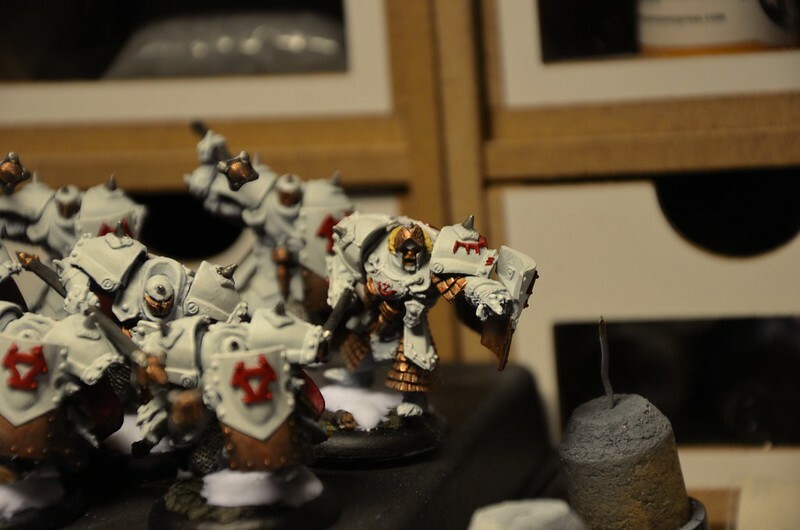 I then switched to pure Administratum grey. 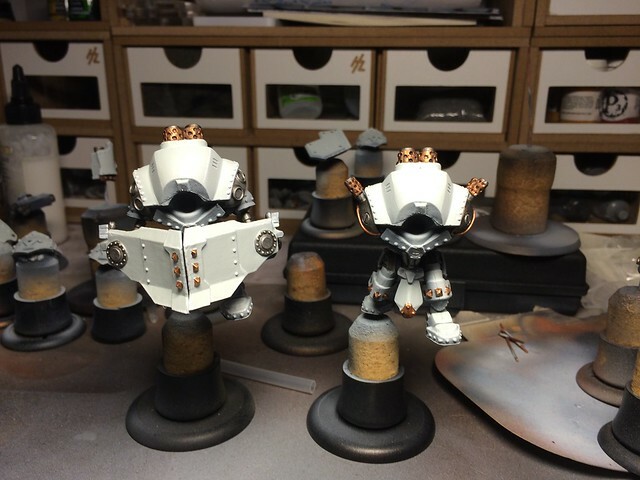 From the Administratum grey I switched immediately to GW Uthuan Grey and applied a few coats until I was up to the color I wanted. I then added an edge highlight of Vallejo Dead White. 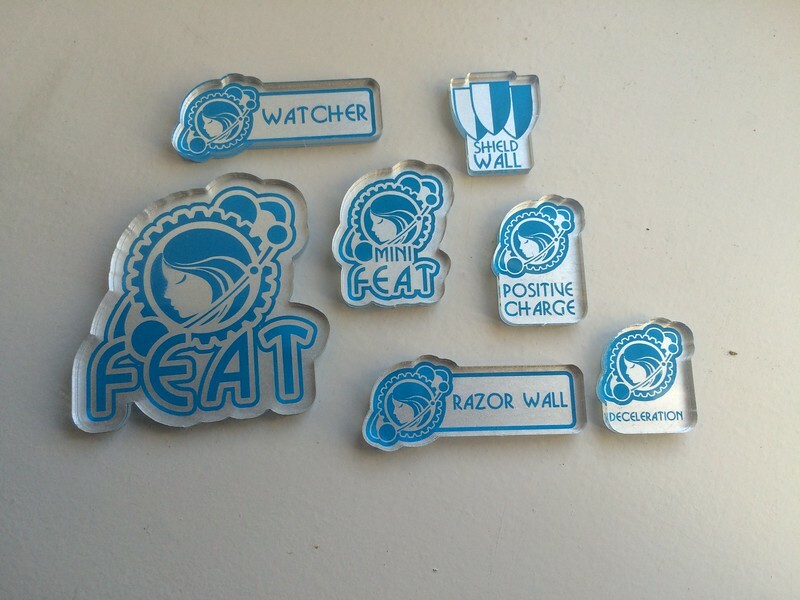 The metals are P3 Cold Steel, P3 Pig Iron and GW Hashut Copper. 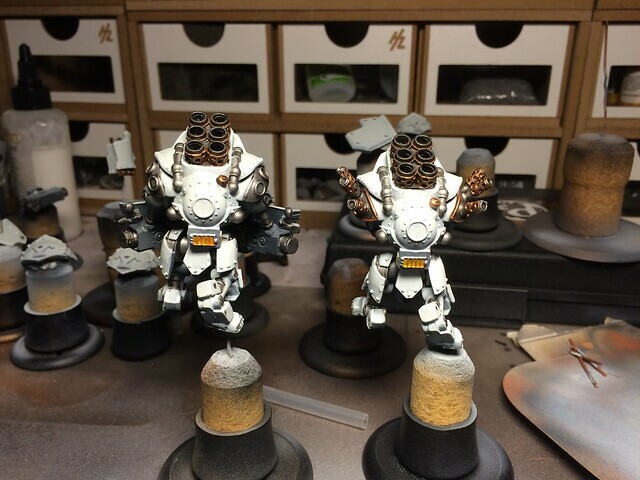 I only added a wash of GW nuln oil after the base coat. 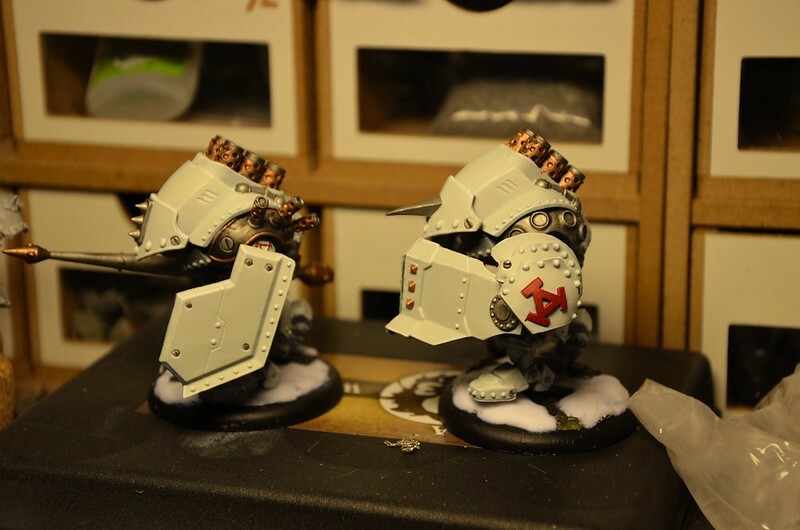 The red on the Khador logos is done using a base coat of Khorne red, highlighted with a few layers of Mephiston Red. 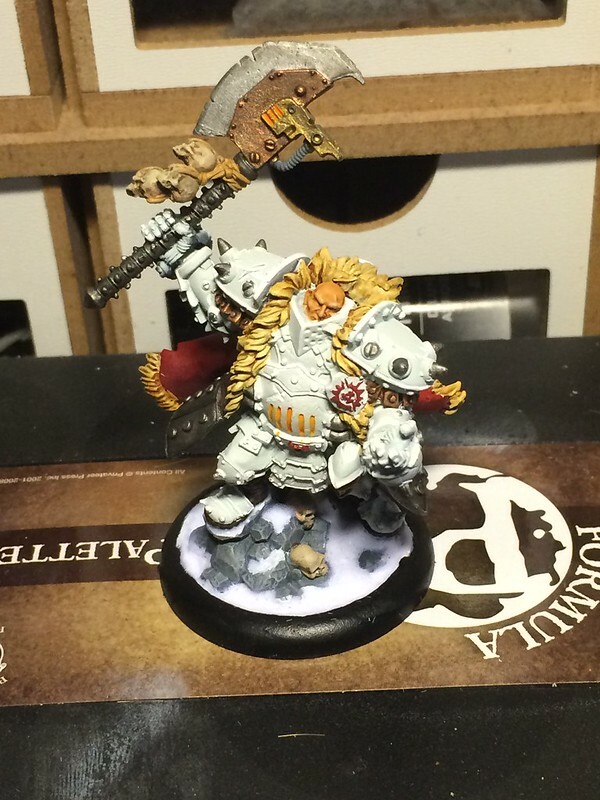 The furnace glow was done using P3 Hearthfire and a GW yellow wash. 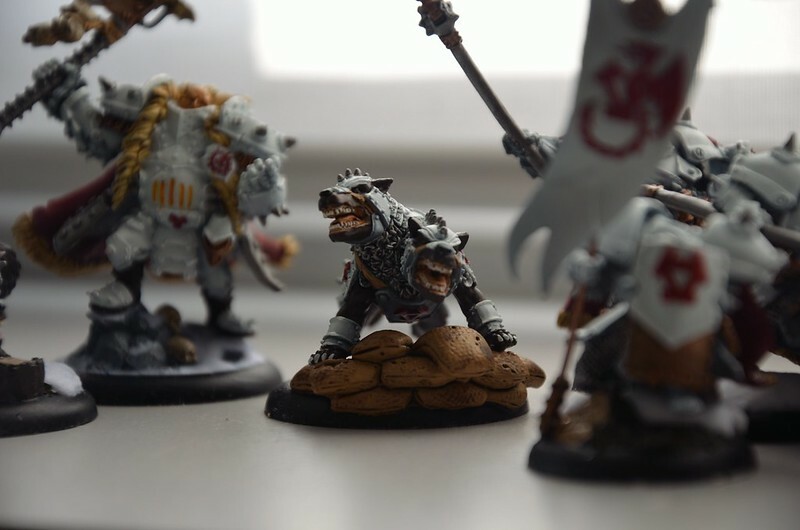 I only have some in progress pics of the jacks right now as I want to take the final pictures when they are on their finished bases. 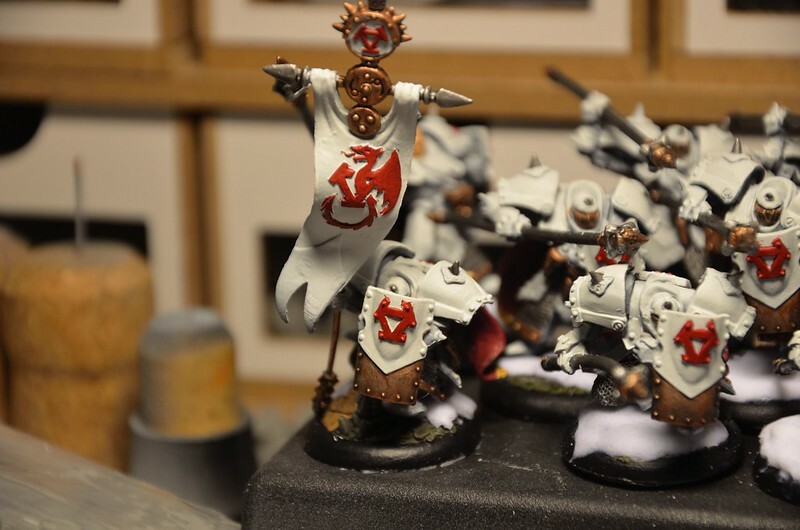 I have been playing Skorne for a good while no wand while I love the faction and will keep putting them on the table in the future, I find the weakness vs Cryx to be an obstacle I can’t cross. This doesn’t mean I think Skorne is defenseless against Cryx, I just don’t like the odds and more specifically Skarre1 with 30 banes is a question I just can’t find the answer to. The less versatile playstyle compared to other factions is also contribution to me wanting to shake things up. The beat face approach is cool and rewarding however it becomes rather bland after several months. The fact that Mordrikaar doesn’t seem to click for me is one of my issues. This is a personal problem which has nothing to do with how capable the model is. I dabbled with several lists for Mordrikaar, even played some games with lists for eHexy and pZaal but they all fell short in my opinion. I’m not a top player so the idea that I would have to play my A game to compete with someone playing their D game doesn’t sit right with me. 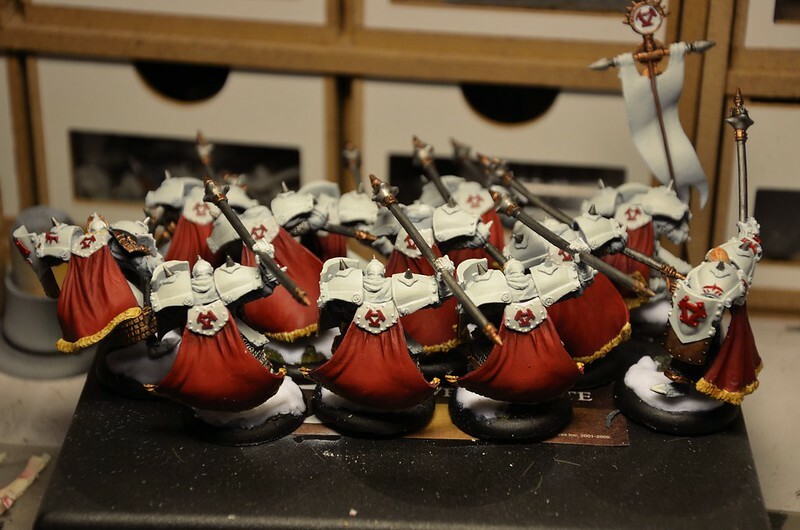 I was tempted by switching factions a few times, my elves were calling from my shelves, my Cryx were seducing me into serving the dragon father once more, but in the end I wanted something new, something different. 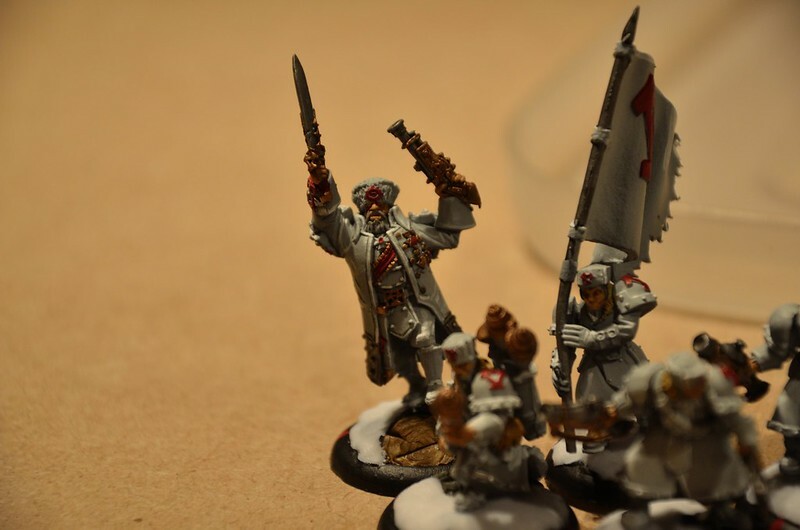 Khador isn’t a first world country faction, but it has all the pieces. Casters like Butcher3, pIrusk, eZerkova, eSorcha interest me and I’m planning on exploring what they can do. 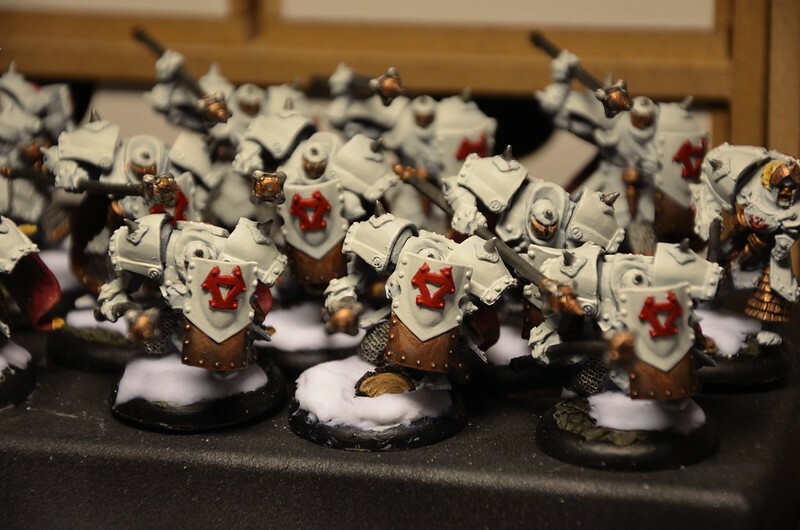 We have a local Khador player who makes them tick extremely well, so I finally have a faction where I can learn by watching as well. Spamming infantry (and thus spending time on activations) will be a challenge. 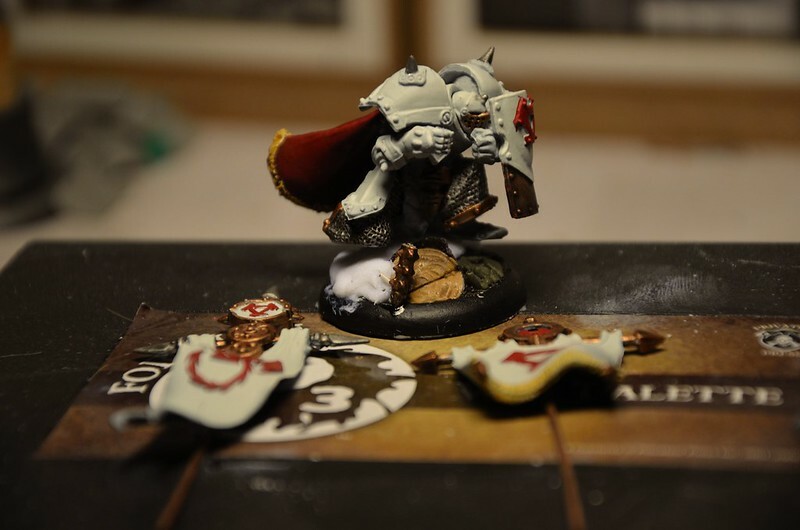 I have gotten better in managing my time when playing seriously, I’m still a disaster in casual games because I just talk have fun and forget about the ticking clock… I feel that my time with Skorne has taught me a range of valuable things that will transfer into my future Khador play. I also realized when checking which models I required for my initial lists, that I already owned a large portion wince I already owned the Nyss, the Boomhowlers and a range of Merc solos. As per the usual I will likely end up owning the entire faction, but I’m pushing myself to be a bit more conservative at first. 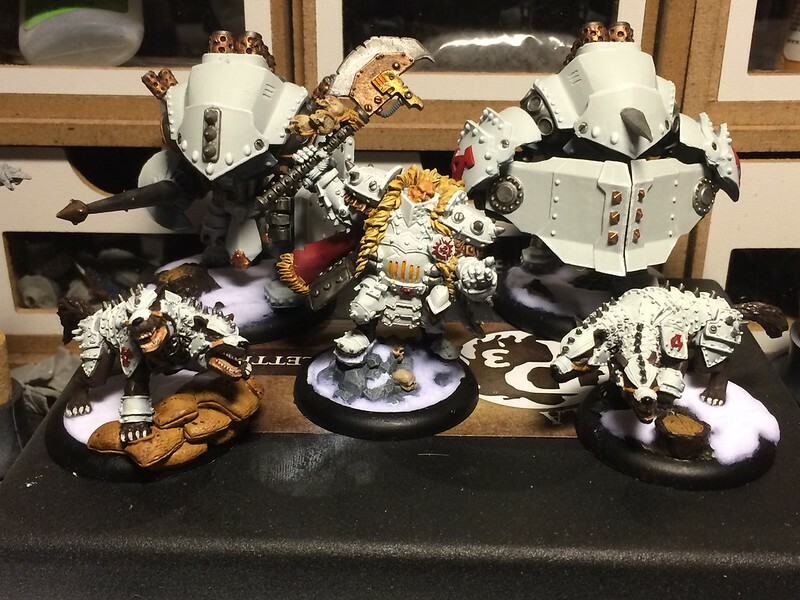 I want to explore the pairing our local Khador player has used before and then see where I end up. What draws me into the faction at this point is the more generalist feel, no real focus on either ranged or melee, no focus on pure spell slinging or making the feat stick. 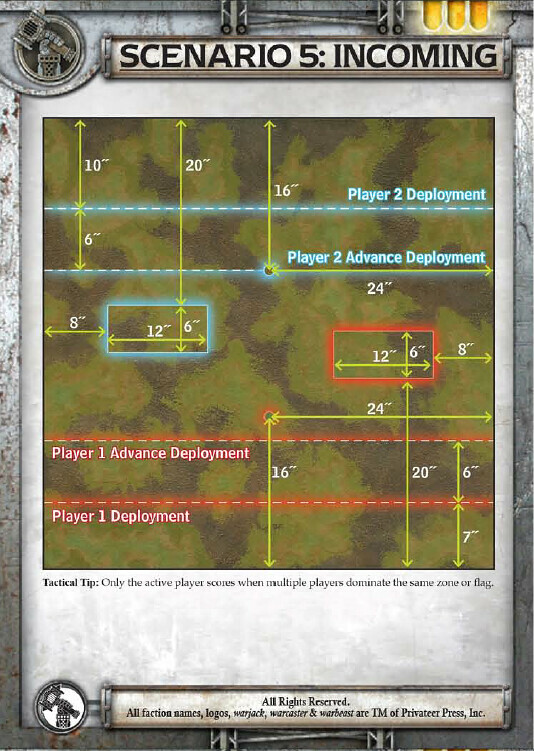 Just coherent army compositions complementing each other and having the different options available while not being pushed towards either side. 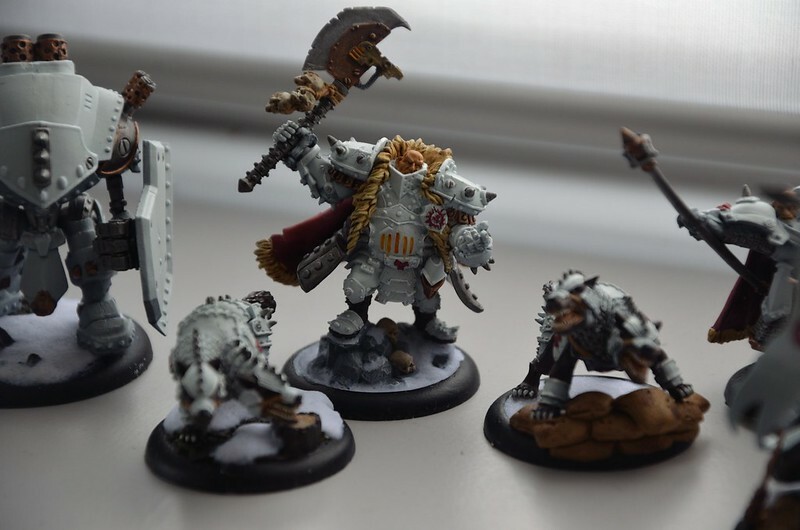 If I get enough things painted by the end of the week so I don’t need an abundance of proxy models, I might get my first few games in this week. I don’t mind playing fist a few more times so there’s no real pressure. 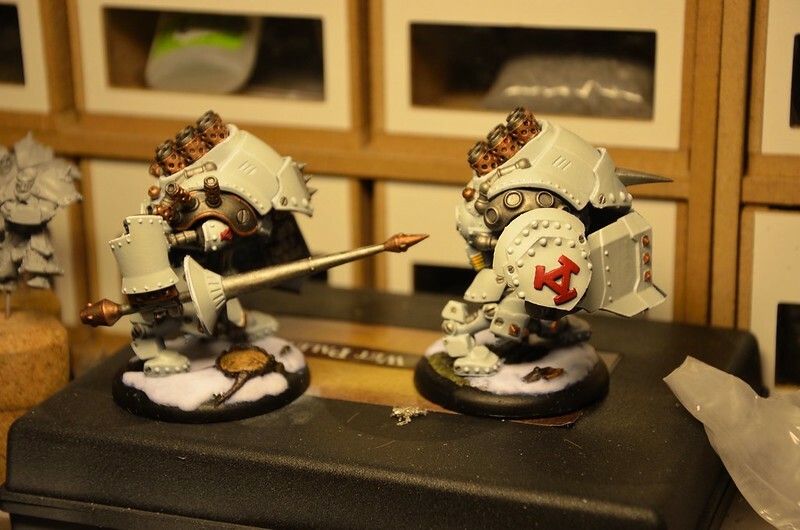 I’m going to post a picture of my painting progress so far with the Khador jacks next.